It’s that time of year again. Summer is hanging tight and temperatures are still hot, but daylight is gradually escaping our hemisphere at the rate of nearly 2 minutes each day during the month of August. And daylight isn’t the only thing disappearing this month. Kids are waking up early, fumbling for their school supplies and lunch goodies, and slipping off to their first days of the new school year – marking the transition from summer break to another season of learning. These changes bring additional challenges, not only for kids and parents, but for pets as well. Our faithful companions will suddenly be thrust into a chaotic scene where new “chewables” and “swallowables” are bountiful and more readily accessible than planned. They will be curious and excited about what is being shoved into backpacks and lunch boxes each morning, and equally as excited after school when backpacks and lunch containers are tossed on the floor, couch, chair, etc. once kids are home. It’s important to anticipate this craziness when it comes to pet safety. Below you will find back to school pet safety tips that will help ensure the only vanishing act will involve children magically disappearing to school each day by foot, bike, car or bus. Watch the video and learn more about Richell's Convertible Indoor/Outdoor Pet Playpen! 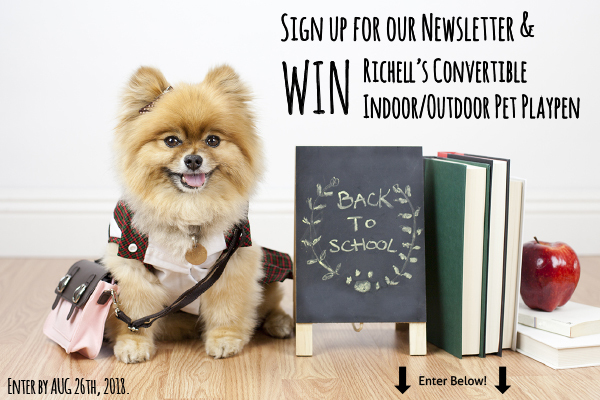 One lucky pet parent will win a Richell Convertible Indoor/Outdoor Pet Playpen L4. Promotion expires 8/26/2018 12:00 PM CST. This promotion valid within the continental U.S. only. Richell USA will not share your information with any third parties. You will also be subscribed to our monthly newsletter filled with product information and helpful pet tips. During late summer and early fall, the ASPCA Animal Poison Control Center (APCC) sees a substantial uptick in pet poisonings in the weeks surrounding back-to-school time. Whether kids are hurried to put items in their backpacks to start the day, or are tired after school and leaving their backpacks in pet accessible areas when they get home, pets have greater access than ever to fun, but potentially dangerous, school supplies. Hazards include pens and pen caps, pencils, pencil sharpeners, crayons, markers, erasers, paper clips, glue sticks, school compasses, coins and bouncy balls. Though only mildly toxic to pets in small quantities, the greater concern for these hazards is their potential for becoming foreign body obstructions. Their sharp / splintering nature could also cause internal injuries. 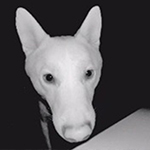 Increased toxicity can occur if items made of PVC (polyvinyl chloride) are chewed on or consumed. PVC school supplies and pet toys should be eliminated from the home altogether. We faithfully pack our kids’ lunchboxes with the healthiest foods possible. Or, at least we attempt to. However, some of these healthy snacks for humans can be toxic for pets. According to the APCC, foods such as grapes, raisins, onions, moldy food, chocolate and macadamia nuts are not good for pets and can lead to them becoming very ill. And items like gum (can contain xylitol) and cold packs, pose a toxic threat to animals if ingested. It’s important to remember that if snacks, or the items listed above, are packed in school lunchboxes, those lunchboxes need to be emptied of all contents after lunch while still at school, or dropped off at home in a safe place away from pets - and not simply thrown on the couch, chair or left on the floor. Some dogs are very talented when it comes to unzipping backpacks or opening lunchboxes, and take full advantage of what they find inside. These irresistible targets are just too tempting for pets, and can get them into a lot of trouble. Albuterol inhalers can be lifesavers for kids with asthma, but are toxic for pets. The same applies to medications for ADHD. They are undoubtedly helpful for kids, but very dangerous if pets ingest them. Even over- the-counter medications like Tylenol, which contain acetaminophen, are dangerous if consumed by pets. And simple first aid staples such as band-aids, can present a choking hazard to a dog or cat. And it goes without saying that illicit drugs accidentally consumed by a pet are also a very dangerous proposition. As stated above, routine is very important to a pet. The sooner a consistent routine is established, the less anxiety pets will potentially experience. Separation anxiety can be a real concern. Dogs have been known to bark, howl, whine, dig, scratch, partake in destructive chewing, house soiling, etc. Healthy, well adjusted cats are less prone to separation anxiety, but cats that have been abused or are not well adjusted can become withdrawn, get an upset stomach, experience a loss of appetite, attempt an escape, or may try and hide. Your pet may now find itself left alone for long periods of time, and they may miss their typical interactions with the kids during the day. Combined with the home suddenly being much quieter, it may lead to pets feeling more anxious, nervous or lonely. Turning on the TV or radio so pets can hear voices, can really help reduce anxiety and give pets the sense that someone is still around. It could also help curb mischievous behaviors if pets think they are not all alone. Also, according to the ASPCA, giving your pet a treat filled toy upon leaving will keep them occupied for a half hour or longer and helps keep their mind off of your departure. If you pick the toy up when you return and then give it back to them the next time you leave, it will train your pet to know that your leaving is “safe” and they can count on your return. Back to school is an exciting time for the entire family. 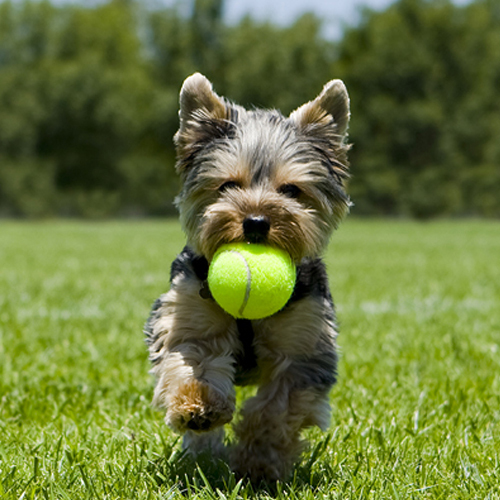 With proper preparation and due diligence, pets can join in the excitement without any pitfalls. A healthy, safe and loved pet is a happy pet. With the back to school safety tips above, combined with a good dose of extra attention, our faithful companions will be able to dive in to the excitement of a new school year routine with all four paws.